We love Madison! Part of a new line of contemporary living room furniture in 2018, this end table might be one of the smallest pieces in the collection but still packs a punch -- especially as shown with simulated barn floor marks, the top in tanbark, and the base in white paint with Van Dyke brown glaze for a rustic look. 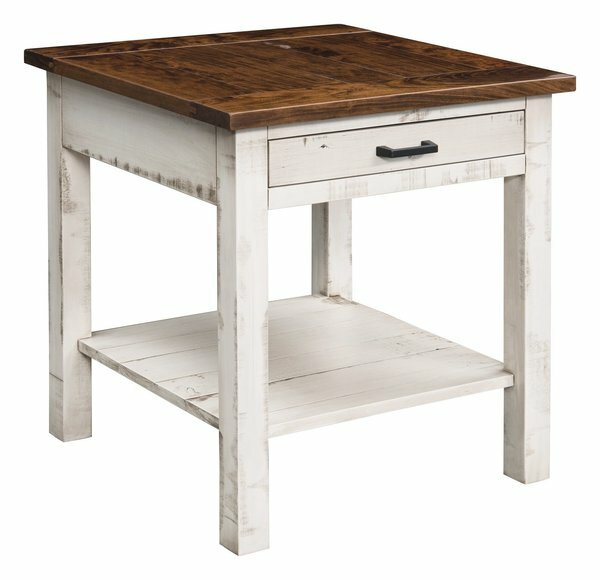 This accent table, that can be made from a variety of wood types, without barn floor marks, and finished in different paint and stain options, features a solid top, inset drawer, and open shelf with plank design. Questions about wood type and finish? Our Amish furniture specialists are here to help. Call 866-272-6773 to speak with one today.